Located on the Peninsula Recreation Area, the Frisco Nordic Ski Center, on the shores of Dillon Reservoir and just minutes from Frisco's charming Main Street, offers an excellent high altitude facility for classic XC skiing, skate skiing, and snowshoeing all with exceptional views of peaks in every direction. The Center, which is one of the few areas in Colorado that employs snowmaking, offers 27 km of ski trails, 20 km of snowshoe trails, rentals, skate or classic ski lessons, and ski tuning, 7 days a week from their location at 616 Recreation Way in Frisco, CO. The Center's trails are groomed by a state-of-the-art Prinoth snow groomer and the center is just steps from the Frisco Adventure Park's tubing hill, beginner downhill ski/ride hill and horse drawn sleigh rides. Trail passes are $20 for adult day pass and $15 for juniors and seniors (17 and younger or aged 60-69), $5 for skiers aged 70+, and free for children 6 and under.older). Rental skis or snowshoes are $20 for adults aged 18-59, $15 for youth and seniors, and $10 for children aged 2-6. A performance ski package is $30 and a high performance package is $35. The Frisco Nordic Center offers a variety of lesson programs and group coaching sessions, along with rental and demo equipment. The Center has specialty clinics for women skate skiing, youth Nordic ski programs and skijoring with your dog. Each season, Frisco Nordic also hosts a variety of special events such as the oldest ski race in Colorado, the Frisco Gold Rush, the Frisco BrewSki, which is a costumed ski tour with beer tasting and Eat, Ski and Be Merry, which is a progressive dinner on skis. There are also a series of citizen races. Group beginner ski lessons are offered 7 days a week with PSIA certified instructors, and a full day trail pass is included in all lesson prices. Lessons are 75 minutes long with up to 10 people, ages 12+ and are $50 each. Semi private lessons for 2-4 skiers are $55 and private lessons for 1-2 people are $65. 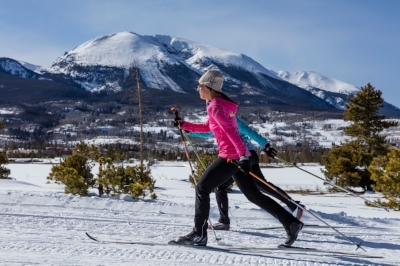 The Frisco Nordic Center is located on Town of Frisco land and National Forest Service land in the White River National Forest and is owned and operated by the Town of Frisco. The Center is open 9:00 AM - 5:00 PM, 7 days a week from late November through early April, weather dependent. Directions: Take Route I-70 west from Denver 70 miles, take Exit 203 and go one mile south on Highway 9. Make a left at the stoplight onto Recreation Way the Frisco Adventure Park. Follow Recreation Way down to the log lodge on your right side. CCSAA member and member of the Colorado Cross Country Ski Association.